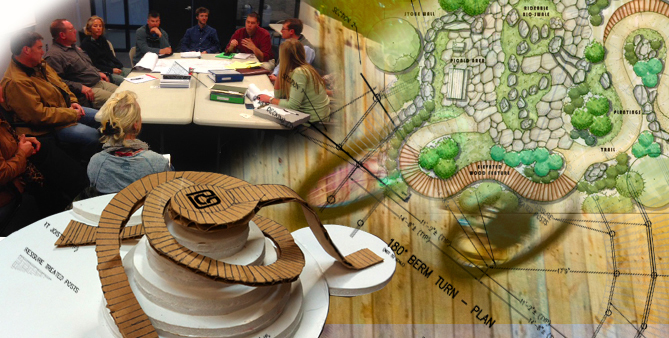 Our team provides multiple services in the trail arena: master planning, grant writing, creative feature design, civil engineering, local, state, and federal permitting, cost estimation, bidding, construction, project management, risk management, insurance coordination, and marketing & branding. Other services we offer include competency in performing feasibility studies, resource inventory and harvesting, generating consensus and garnering community support, developing signage and marketing branding, building websites, and computer rendering. Ride Garden members maintain excellent personal credentials in multiple outdoor recreational sports industries (mountain biking, mountain boarding, paddleboarding, kayaking, skate boarding) and utilize long-term relationships with private land owners, municipalities, resorts, to develop partnerships with a shared goal of facility development with maximum impact and economic success. The first step in every new project begins with listening to our client. Our goal is to provide the facility that you want. That begins with understanding the desired outcome of your project. Each project has its own unique scope and objectives. We aim to provide a one-stop shop experience from speaking with land managers and owners well before the first shovel hits the dirt to assisting with acquisition of facility insurance coverage during the critical planning and design phases. Once the project objectives have been Identified Ride Garden will develop a comprehensive plan to achieve your objectives. Behind every successful project lies a solid plan. Our team will research all land resources and pertinent local, state, and federal regulations to properly layout a roadmap for successful project implementation. When appropriate we will solicit the support of and involve project stakeholders, recreational peers, and the community to gain feedback and establish a budget for implementation. We live within an era of dwindling financial surety. The inability to garner funding can often be the obstacle to commencement of projects that started from someone’s great idea. We have a proven track record of writing and obtaining grants to fund trail building projects. Our team will work diligently to execute the plan. With in-house engineering, design, trail building, web development, marketing, and legal council our goal is to build the best facility for the available funding to protect the client’s investment, insure fun and safety for the facility users, and maximize the return on investment. We involve other local professionals and volunteers skilled in all facets of trail planning, design, and building to bring the dream of new trail facilities to reality. No project is completed without the assistance of numerous parties along the way. When appropriate, Ride Garden partners with other entities and companies allowing expertise of multiple individuals and companies to contribute to successful implementation in the interest of the client. What good is a trail if we aren’t having fun building and riding it? Ride Garden likes having fun and providing a safe environment for individuals, families, and kids to develop skills for greater enjoyment of outdoor recreation. There is nothing better than coming back to a facility once open and seeing a smile on the faces of all the users.